Week 1, Day 1 of My Eating Well Challenge. This meal was absolutely fantastic. The pork was super-juicy and the flavor of the rub did not overpower that of the pork. The only thing it needed was more salt. But it is the watermelon salad that is going to become a household recipe. If you invite me to a barbecue this summer, it’s what I’ll be bringing. It is bright and interesting, savory, sweet and refreshing. View the recipe and nutritional info. at EatingWell.com. The bright fresh taste of a watermelon and cucumber salad makes a sensational counterpoint to the fiery spice crust on this succulent pork tenderloin. It’s important to brown the meat before roasting, since this cut cooks too quickly for the surface to brown and caramelize in the oven. Grill enthusiasts may omit the stove-top browning (Step 3) and grill the tenderloins over medium heat, covered, for 20 to 25 minutes. 1. Preheat oven to 375°F. Line a baking sheet with foil. 2. Mix sugar, coriander, cumin, salt, chile sauce and 1 teaspoon oil in a small bowl to form a smooth paste. Rub the paste over the pork. 3. Heat remaining 1 teaspoon oil in a large nonstick skillet over medium-high heat. Add the pork; cook, turning occasionally, until browned on all sides, about 3 minutes. Transfer to the baking sheet. 5. Meanwhile, make Sweet & Tangy Watermelon Salad. Carve the pork into 1/2-inch-thick slices. 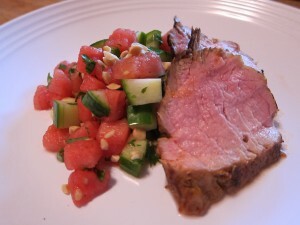 Serve with the watermelon salad. Stir together vinegar and sugar in a medium bowl until the sugar almost dissolves. Add watermelon, cucumber and cilantro; toss gently to combine. Just before serving, sprinkle with peanuts. This entry was posted on Tuesday, May 11th, 2010 at 1:52 pm	and is filed under Recipes. You can follow any responses to this entry through the RSS 2.0 feed. You can leave a response, or trackback from your own site.